During today’s Nintendo Direct, Nintendo gave us some new details about the upcoming mecha shooter Daemon X Machina, revealed during E3. Daemon X Machina puts you as a mercenary fighting against rogue AI to protect the last vestiges of humanity after the fall of the moon. You control a mech known as an Arsenal, and as you defeat enemies you can take weapons and parts from them and equip them to your Arsenal on the fly. Taking them back to the base after a level adds them to your overall armory, from which you can then select them as part of your starting loadout in future missions. At any point during a mission you can leave your Arsenal and explore the area on foot, although the benefits of doing so haven’t been expanded upon yet. As you advance you can get enhancements for your human form, which translate to improvements to your Arsenal’s capabilities. 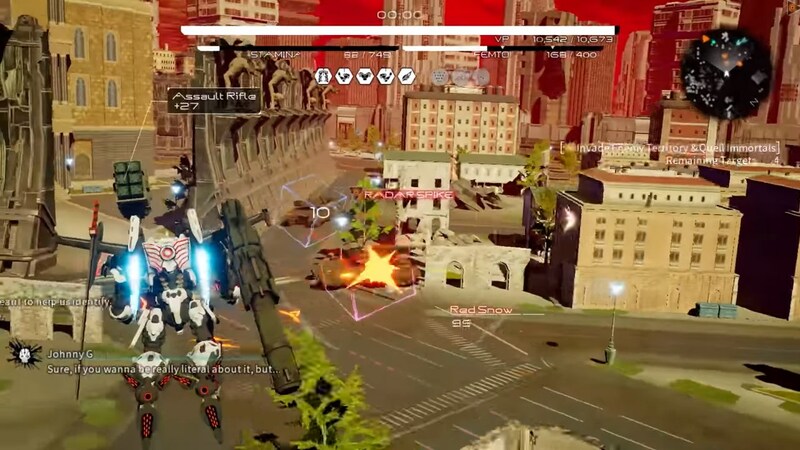 Daemon X Machina will also have online co-op where players can work with up to three teammates to take on bosses. The game is set to release from Marvelous on Nintendo Switch in 2019.